It was a particularly barbaric crime: A driver fatally struck a person who was crossing the street with a walker, then left the scene. That it was the second such death in a matter of weeks is another reminder that New York City, thanks in part to indifference in Albany, is failing to meaningfully address its ongoing epidemic of deadly hit-and-run collisions. Marlene Zotti in a family photo, via the Post. 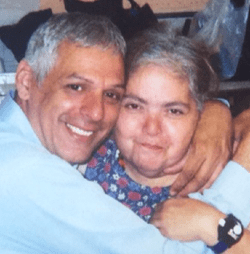 Last Sunday at around 12:30 a.m., 59-year-old Marlene Zotti was crossing Ninth Avenue at 42nd Street in Borough Park when a man, identified in the press as Marco Ortiz, ran her over with a minivan. Ortiz allegedly did not stop to summon or render aid. Zotti, who had diabetes, had exited the B11 bus shortly before she was hit, the Post reported. She died at the scene. On Monday, more than 24 hours after the crash, Ortiz turned himself in at the 66th Precinct, according to the Post. The Post said Ortiz “told police he had been arguing with his wife” before hitting Zotti. Brooklyn District Attorney Ken Thompson charged Ortiz with leaving the scene, a D felony that carries penalties ranging from probation to seven years in prison, according to court records. Thompson filed no charges for the act of killing Marlene Zotti. Motorists who leave the scene, of course, can’t be tested for intoxication immediately after a crash. Under state law, drivers who may be impaired have an incentive to flee, since the penalty for hit-and-run is less severe than causing death or injury while intoxicated. State legislators have failed to fix the law. Spurred in part by Albany inaction, the City Council and Mayor Bill de Blasio adopted a law to attach fines to hit-and-run crashes. But because of how the law is worded enforcement hinges on NYPD making an arrest and requires proof that a driver knew or had reason to know a collision occurred — the same loophole in state law that allows hit-and-run motorists to avoid criminal penalties. Meanwhile, NYPD does not investigate all hit-and-run crashes, and cases that are investigated often don’t result in arrest. Transportation Alternatives found that of 60 fatal hit-and-runs investigated in 2012, NYPD arrested just 15 drivers. Hit-and-run drivers killed at least 13 city pedestrians and cyclists this year through the end of July, according to crash data compiled by Streetsblog. In five of those cases the driver was not immediately caught or identified. And in New York City, identifying a hit-and-run driver does not necessarily lead to an arrest. On July 2, the driver of a private sanitation truck ran over Alberta Bagu on Broadway in Bushwick. Bagu, a 46-year-old who had multiple sclerosis and, like Zotti, was using a walker, was left to die in the street. NYPD told the press Bagu was “jaywalking.” Police and Thompson filed no charges against the driver. I wonder how many times more people traffic violence has killed since 9/11 than died in 9/11. Yet which tragedy do people still care about to this day in NYC. Vicious and baseless attack on public servant. Bratton has made numerous public comments in a number of venues that pedestrians are undesireable and that high speed motor traffic needs to return to Manhattan streets. this is the leader of the NYPD forcefully telling his 38,000 member force that killing pedestrians is a-okay. Unfortunately, our news media seem to concentrate on mass casualty events, even though the “body count” from street and highway collisions is the equivalent of a loaded jetliner “buying the farm” every other day. Lol, double speak, the vicious and baseless attack is upon the public at large, by people who insist on preferring traffic flow to safety, and on those who refuse to even enforce restrictions on unsafe driving. Brad’s right that this is “particularly barbaric”–unfortunately, it’s not also particularly unusual. It happens every few months at least. And the cause seems pretty clear: people really, really believe that street violence is as much the result of human agency as meteor showers. This guy is smart. I imagine the cops being very sympathetic to his arguing-with-wife alibi. Who hasn’t argued with their wife and gotten all stressed out? Poor driver. No criminality suspected — except for maybe his wife. Let’s prosecute her. It’s human nature, but that doesn’t make it any less terrifying to be crushed by a motor vehicle than by a falling building. Citation? Or just your interpretation? I was thinking the same thing. In what world is ‘arguing with my spouse’ exculpatory evidence for killing another human being? Should we add ‘driver arguing with spouse’ or ‘victim was disabled anyway’ to the list of right-of-way exemptions for NYC? The careless operator remained on the scene and was not charged, police said. And CBS2 reports of another death in the Bronx.